How Is Sharing Enforced in Custom Force.com Apps? Where Do You Need to Add “with sharing”? 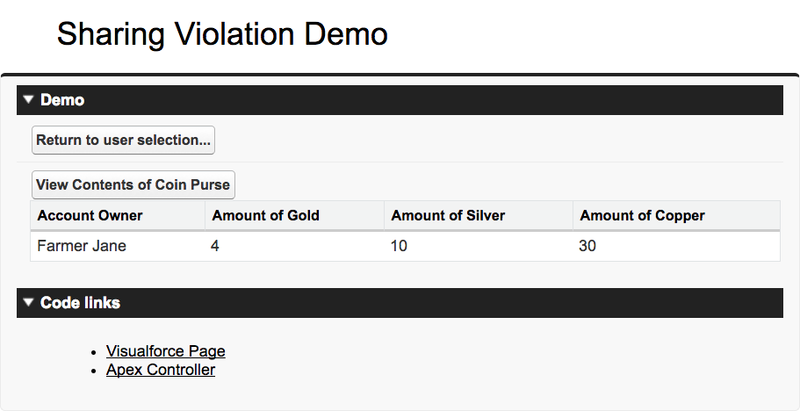 Identify sharing violations in Apex classes. Enforce sharing rules securely in Apex classes. As we learned in the first unit, Salesforce lets developers and admins control access to data at many different levels. Sharing is a specific setting that gives you record-level access control for all custom objects, and many standard objects. To learn more about different types of sharing, see Understanding Sharing in the Apex Developer Guide. Back in the Kingdom Management developer org, our admin has configured sharing rules for some of the objects in the org. One of these is the Coin_ Purse__c object. The admin has configured this object to have private sharing. By setting the organization-wide default sharing to “private,” our admin has restricted access to this object so users can see only their own records. This means that while Astha the Mighty can see that she has 400 pieces of gold and silver in her coin purse, she can’t see that the king currently has 50,000 pieces of gold. Remember that Apex classes execute in system context, so by default Apex executes without enforcing sharing rules. This means that the sharing rules our admin configured are bypassed by default in custom apps. Let’s explore this. Log in to your Kingdom Management developer org. Select the CRUD/FLS & Sharing app in the top right. Click on the Sharing Demo tab. In this app, users can view an inventory of the gold, silver, and copper coins that they have in their coin purses. As this data is potentially sensitive, we want to make sure that users can only see the contents of their own coin purses, and don’t have access to others. Similar to the other apps we’ve looked at in this module, you can use the dropdown on the top left to simulate different users in the kingdom and verify that we’ve configured our access controls correctly. Using the dropdown, select the Farmer to simulate what this user sees in the UI. Click View Contents of Coin Purse. Oh, no. 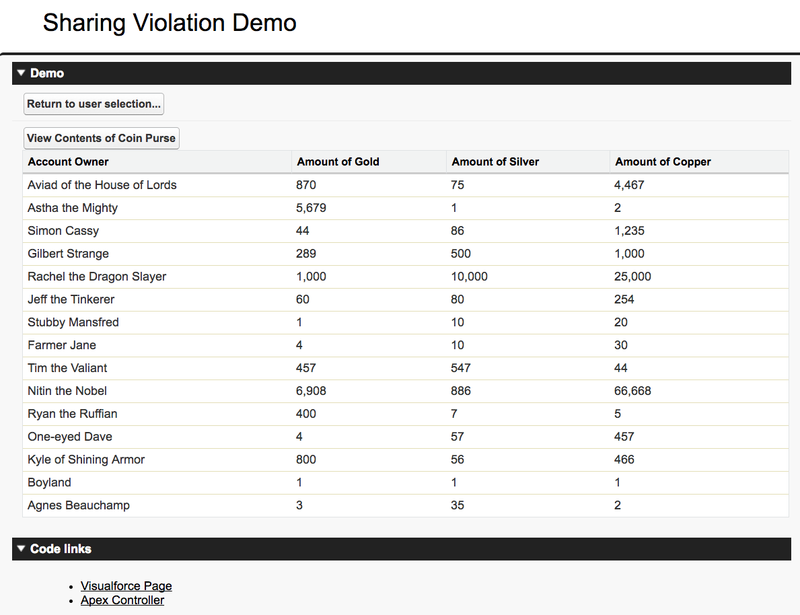 As the Farmer, you’re able to see how much gold many other users in the system have, not just your own. This is a sharing violation. Remember, our admin set the Coin_Purse__c object sharing setting to private. Let’s see what’s happening. Click Return to User selection to return to the Admin user. Click the Apex Controller link to view the code. The code is fairly straightforward. The app queries the database and returns objects back to Visualforce to be rendered. However as we learned Apex operates in system context, so this query doesn’t take sharing rules into account. This is why additional records are displayed in the app. How do we fix this? Luckily the platform provides an apt keyword, “with sharing,” which you can add to your class definition to enforce sharing rules in Apex. It’s as simple as that! To take advantage of this benefit, you need to declare all classes (including virtual and abstract classes) with “with sharing” keywords. Now let’s fix our app. Click on the Apex Controller link. Navigate back to the Sharing Demo tab and select the Farmer user from the dropdown. Now you see only the Farmer’s gold supply, not information about other users. Perfect! Now that you see how important the “with sharing” keyword is, you may be asking where exactly you need to apply it. The best approach is to apply it everywhere you need to enforce sharing rules. This includes inner classes, asynchronous Apex, and Apex triggers. When working with classes that define an inner class, make sure you apply sharing to both class definitions. Sharing isn’t inherited from an outer class. Below is an example of how to apply sharing to both outer and inner classes. It’s important to enforce sharing on your asynchronous Apex classes as well. Sharing doesn’t depend on whether the class executes asynchronously as a scheduled job or batch job. If your class accesses standard or custom fields, prevent sharing violations by declaring the “with sharing” keyword. Invoking a trigger from a class without sharing is also insecure. Remember that Apex triggers run in system context. By default they run without taking sharing rules into account. Because the class isn’t defined “with sharing,” it lets the user see all Opportunities that he/she does not have the access to view. To prevent this sharing violation, define the class with sharing. So remember that whenever you write Apex, whether you’re writing a trigger, async, or just a regular controller, always define the class with the “with sharing” keyword to ensure that sharing rules are enforced.